Armstrong’s latest Cosmic X project follows the successes of his “Cosmic Starship Harley”, the world’s most expensive Motorbike, a Harley Davidson V-Rod, unveiled and sold for over $3M in 2010 and now back on the market for $10M, and his “Cosmic Star Cruiser”, a bicycle launched in 2014 at the prestigious Big Boys Toys in Dubai. Jack nicknamed “The Last Wizard” by his friend Andy Warhol proved it is possible to sell high value art without the top galleries and auction houses he railed against for years. Around 50% of all art is sold privately today because of the high costs of these establishments. His ‘sticking the boots in’ is perhaps his ultimate statement against what he called the art cartel. The majority of talented artists never break through the establishment wall while those few favoured artists become multi-millionaires. He has promised to help more talented artists break through this barrier. He vowed to paint only 100 canvases in his lifetime. His unique Cosmic X style of art combines extreme colours and textures with words that magically appear throughout each painting when viewed at different angles, his bold signature often in the centre. Around half of his collection is already in private hands. Listed amongst his collectors are such names as Alice Walton the Walmart Billionaire, Narenda Patel, a world-famous architect, Donny York of the group Sha Na Na and Michel Polnareff the famous French singer. His collectors are not eager to sell. This scarcity factor guarantees an ever-increasing price. A movie and a PBS documentary are already planned about his life and in 2020 Armstrong is set to launch the world’s most expensive automobile with a price tag of $100M along with a line of fashionwear. There really is no stopping him!! 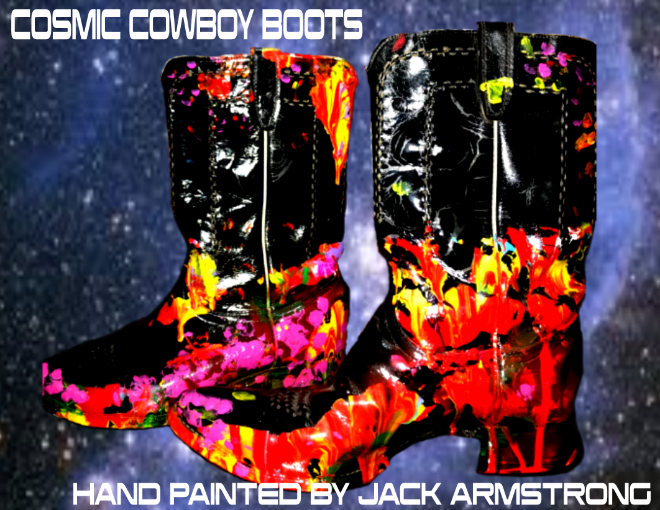 These ‘Cosmic Cowboy Boots’ may not be to everyone’s taste and you may ask why paint them in the first place? 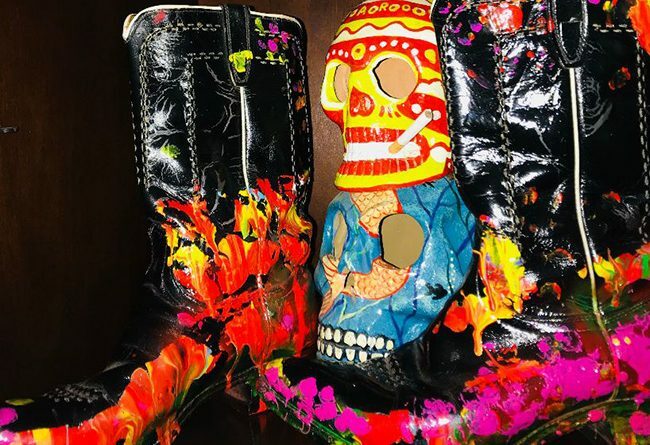 “Well, Van Gough painted boots but never his own. Not many people know that.” So, one things for sure at least – Jack Armstrong has scored another FIRST that’s bound to shock the world. 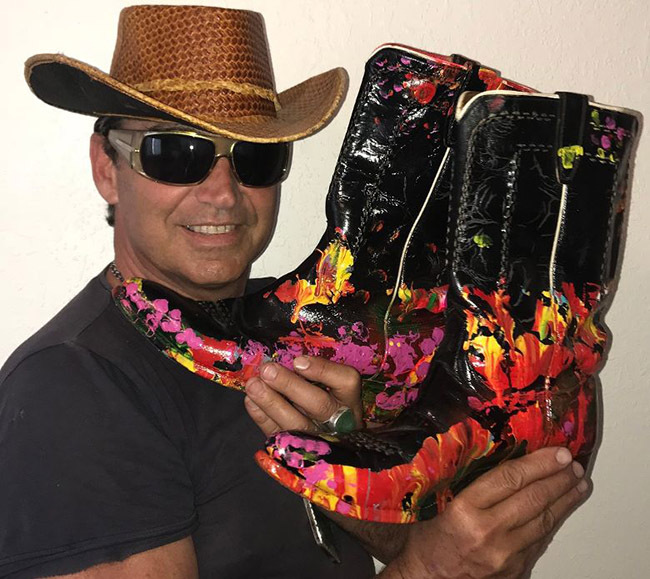 These boots may not be meant for walking but are certainly meant for talking! Anyone watching…Time Square main digital bill board will be displaying the boots!